Born in Connecticut, Hal and his family moved to San Diego when his father, a Naval Officer, was stationed in Southern California. After growing up in Pacific Beach, Hal joined the Navy following his high school graduation and continued his family’s legacy of serving our country. He enjoyed a long and successful career in the Navy as a Data Processing Technician and retired in 1996 after twenty years of service. Following his retirement, Hal returned to the classroom and earned a degree in History from Excelsior College. From there, he began working in construction as a Land Surveyor; however after five years in the industry, the 2008 stock market crash hit and Hal was laid off. From there, Hal’s life began a downward spiral, during which he turned to drugs for an escape from his reality. Living off of unemployment, he and his family lost their home – forcing Hal to move into his car and his wife to move in with her mother. However after six months of living in his car, Hal was in an accident – leaving him homeless and estranged from his wife. It was at this point that Hal set his sights on regaining control over his life and checked himself into a 90-day rehabilitation program through the VA. 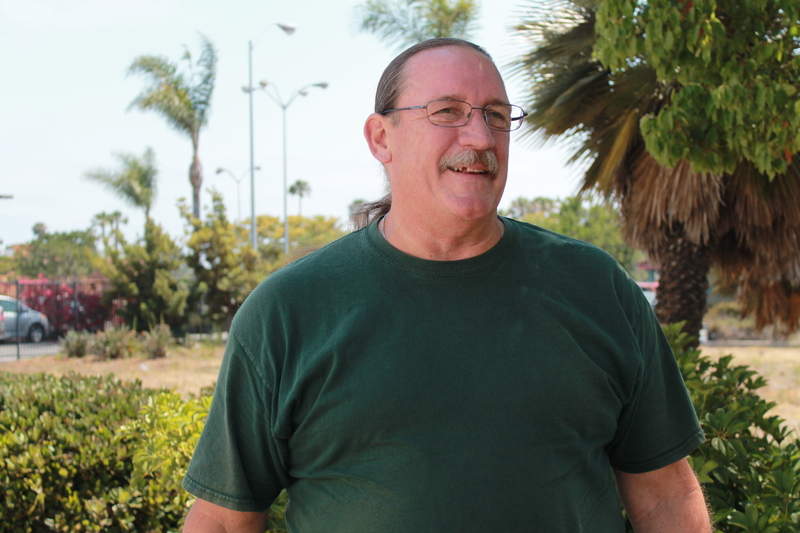 Upon graduating from the program, Hal was connected to an Interfaith Program Manager in the veteran department, who recommended that he be placed in our transitional housing program in Oceanside. Upon moving in, Hal jumped into the program wholeheartedly, attending life skills classes, remaining active in his recovery and making friends with his roommates. However, his attitude wasn’t the only thing that changed in Hal’s life. He began saving his money, was able to buy a new car, and starting supplementing his pension by working for ride-sharing apps Uber and Lyft. Hal also went through training courses, physicals and earned the necessary credentials to be accepted into the United States Merchant Marines, a fleet of civilian ships that carry imports and exports for the U.S. Even more importantly, because of the incredible leaps and bounds Hal has made over the last year, he has reunited with both his wife and their three-year-old son. Three weeks ago, the newly reunited family was able to move into their own two-bedroom apartment in Vista with the help of Interfaith’s Supportive Services for Veteran Families program. Today, thanks to Interfaith’s help and his own hard work, Hal and his family are looking forward to beginning this new chapter in their lives. For more information on how you can help veterans like Hal while on their road to self-sufficiency, please click here.